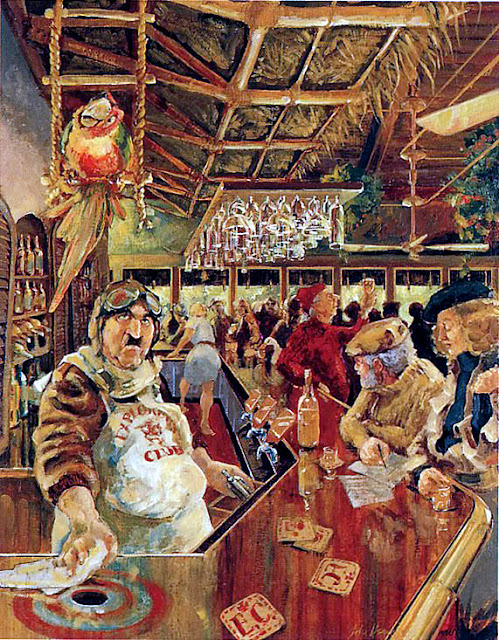 The fabled Adventurer’s Club at Disney’s Pleasure Island was much loved and many protested loudly when it was shuttered for good. It (like all of Pleasure Island) always felt a bit forced to me. Too much pretending that it was New Year’s Eve (when in fact is was Tuesday November 8th or whatever) and too much contrived “spontaneity” for my taste. Things either really happen organically and randomly to produce fun or they do not, pretending that carefully orchestrated events are spontaneously happening in this setting always felt off. However the actual building and the art direction was spectacular. I often wished that I could just roam around and check out the details without being jostled by drunks in flip flops looking for some faux frivolity or being accosted by drama school drops outs dressed in feather boas… but that’s just me. The mothership may not be all she was cracked up to be. 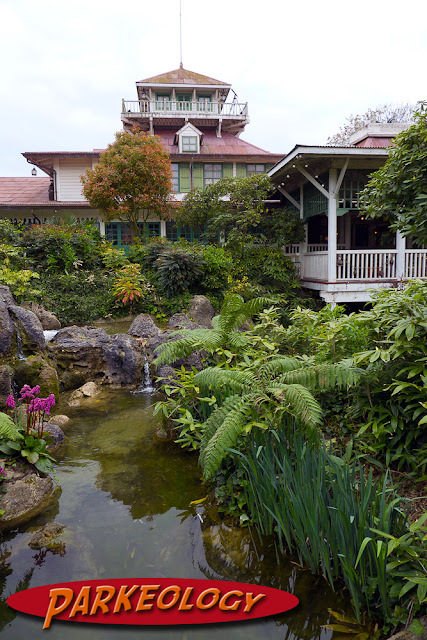 What many don’t realize is that there was a sister establishment of sorts across the ocean at (then) Euro Disney. 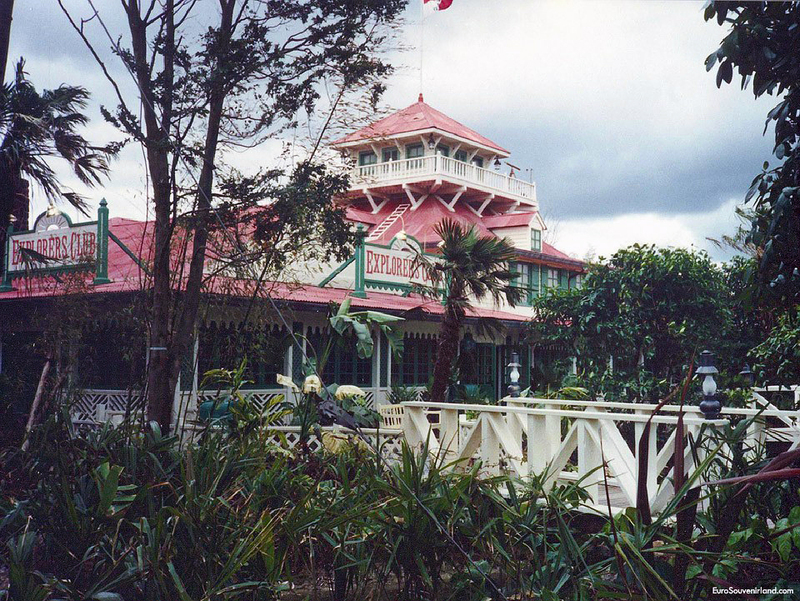 The original Adventurer’s club opened in the spring of 1989 while the new Explorer’s Club opened with the rest of Euro Disney three scant years later in 1992. 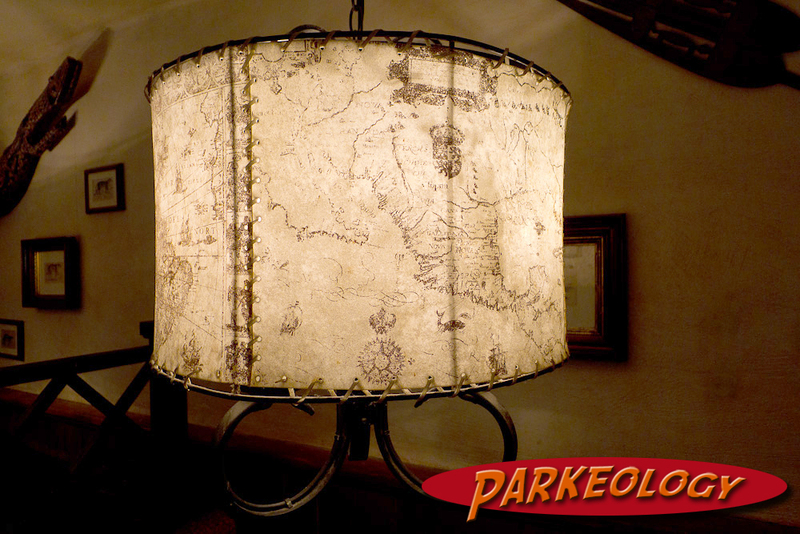 Adventure awaits… and a standard 15% gratuity. 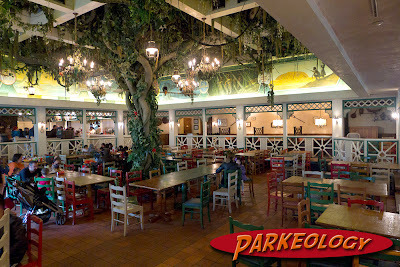 Situated in the new park’s Adventureland The Explorer’s Club left behind the bar-nightclub model and opted for a full service sit down restaurant instead. Much of the theme and general feel carried over. It was a home away from home club for the adventurous world traveler. While never explicitly stated it was generally set in the late thirties much as the Adventure’s Club was. 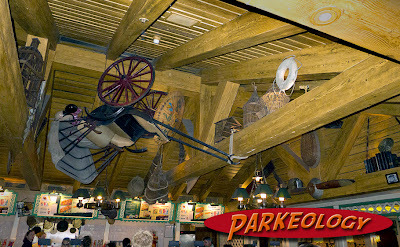 It shared the exotic theme of being a gathering place for explorers and bons vivants filled with props and photographs from around the world festooning the walls and dangling from the rafters. 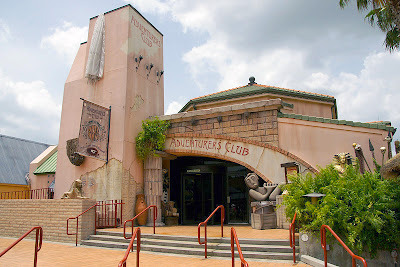 Where the Adventurer’s Club took on a more formal European gentleman’s club feel the Explorer’s Club was set on the edges of a dense jungle and the foliage was in fact taking over much of the club. 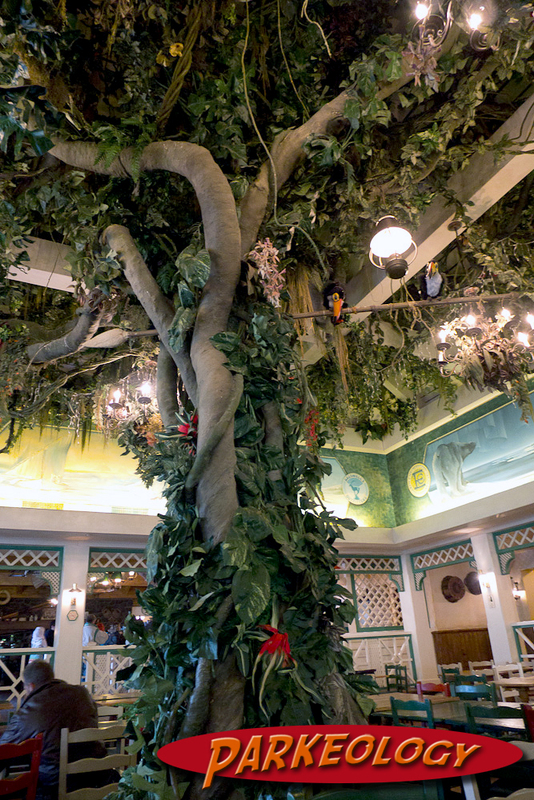 Overgrown trees sprouted from several spots within the club, their branches forming a leafy canopy above dinners. Perched within the leaves were several audio-animatronics birds that would put on shows and interact with guests. This concept dates back to the original Enchanted Tiki Room at Disneyland and has been toyed with many times in Disney’s past. 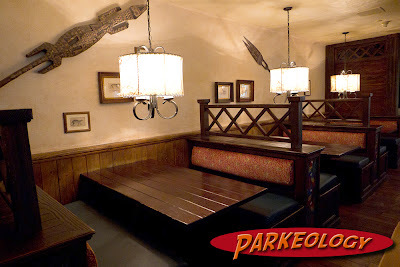 This was the perfect execution of it, as dinners would enjoy the show while experiencing a full British Colonial menu. 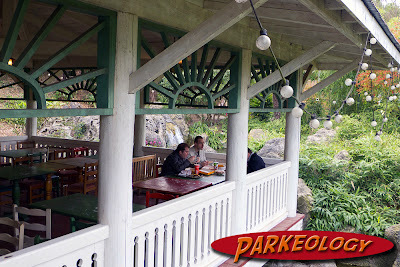 The main dining room as seen today, no more table cloths and far fewer animatronics. 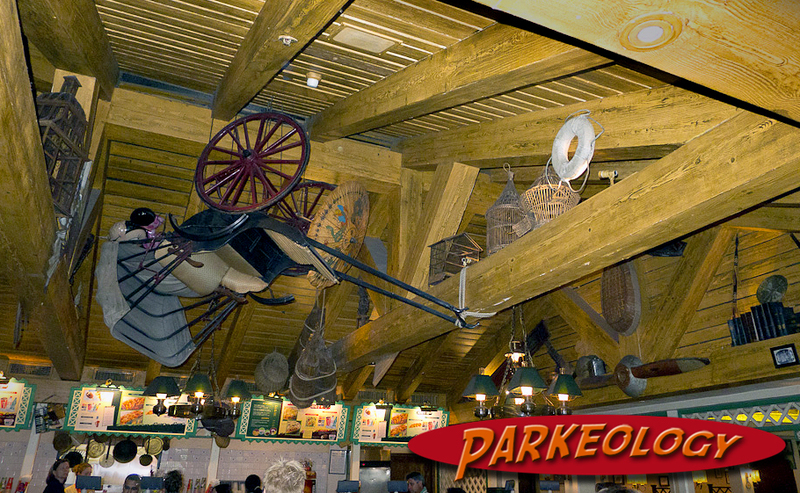 The former bar area still has some props hanging around. 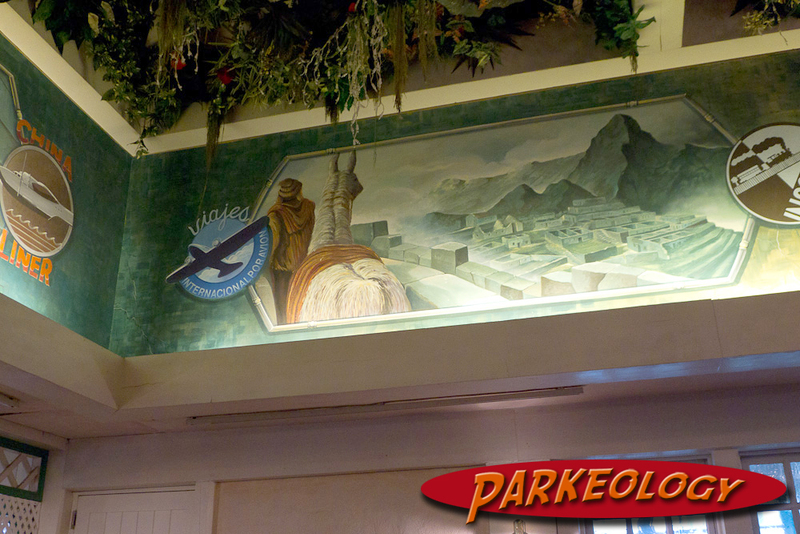 Dramatic murals depicting journeys from around the globe ringed the main dining room. This was classic Disney, details upon details poured into a unique spot. 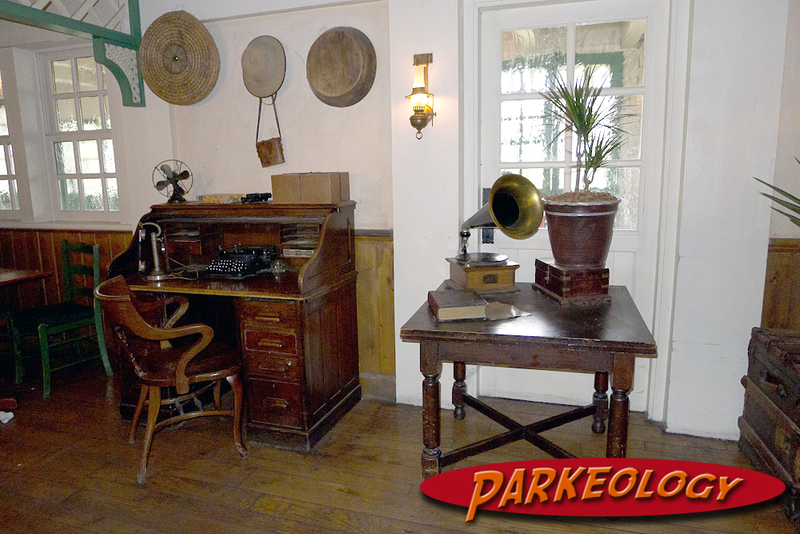 They took much of the best of the Adventurer’s Club and shook it up creating an outpost unlike any other. 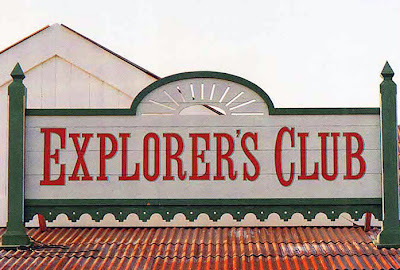 Come to think of it they really should have switched the names; The Explorer’s Club felt more adventurous than the Adventurer’s Club did. 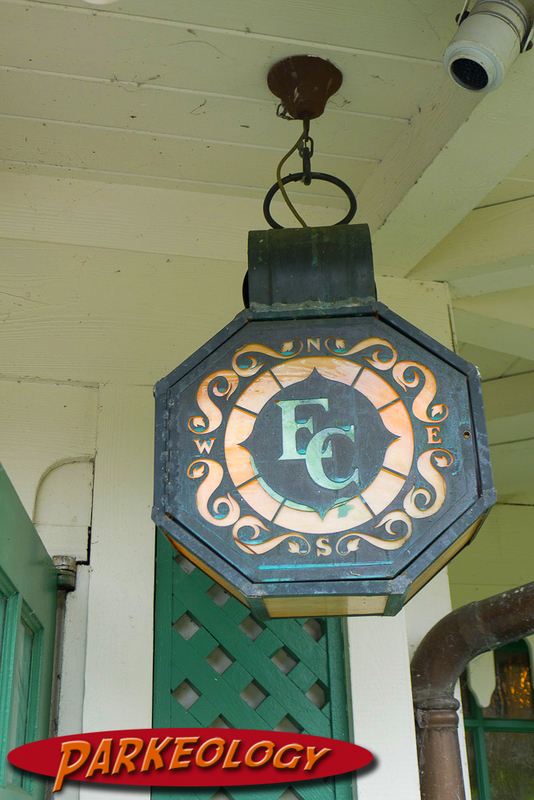 Click on the pictures to see big versions… great detail and check out the “EC” logo. Parkeologists will find these lost clues to the past. 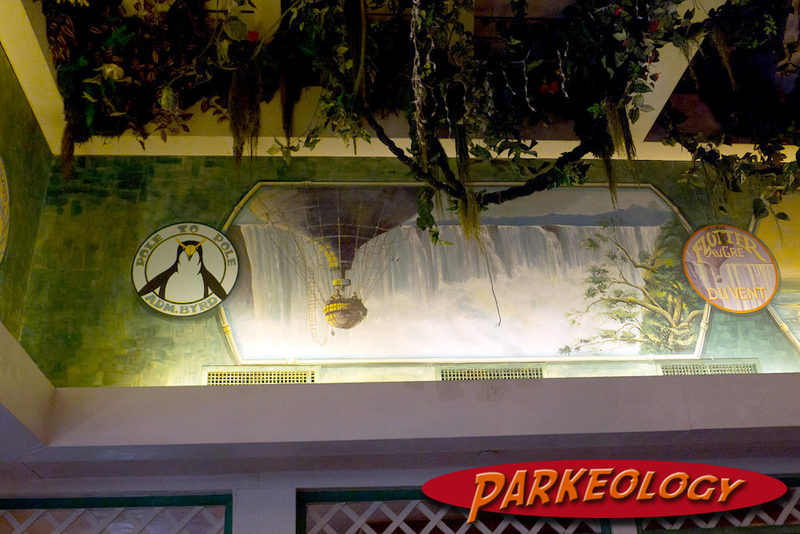 The murals cover everything from the wild west to the deep see to dense jungles and the frigid arctic. Furthering the depth of the experience, (and undoubtedly upping the annoyance factor) were costumed actors playing the roles of explorers along the lines of David Livingstone, William Parry, amelia earhart or even Indiana Jones. 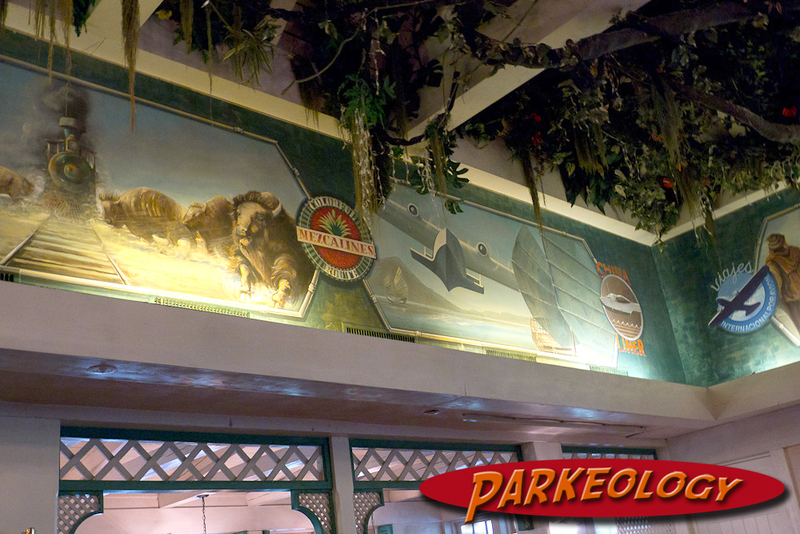 They would interact with the patrons as well as the animated birds and props. The club also had a resident musician, a ukulele playing Brit who would often don a pith helmet and sing somewhat racy songs. 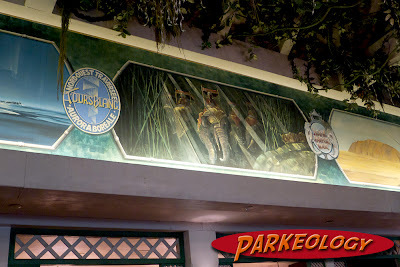 Combining the music hall tunes, the actors and the animatronics along with the deep theme and many props it is easy to see that the Explorer’s Club had great potential. it’s own version of the Indiana Jones Adventure just beyond the Explorer’s Club. Then the park opened and the place tanked. The mistakes made by Disney with the opening of Euro Disney are legendary… too many hotels, not enough attractions and too many sit down dining establishments (the small original park had five of them). Disney reacted and the Explorer’s Club was hacked apart and transformed rather quickly into a counter service joint. 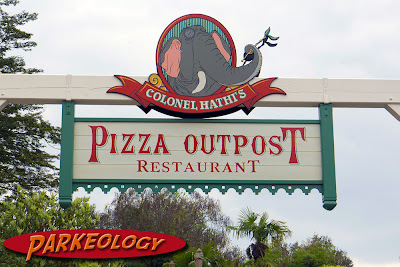 Briefly they served Chinese food before being changed again into it’s current incarnation; Colonel Hathi’s Pizza Outpost. 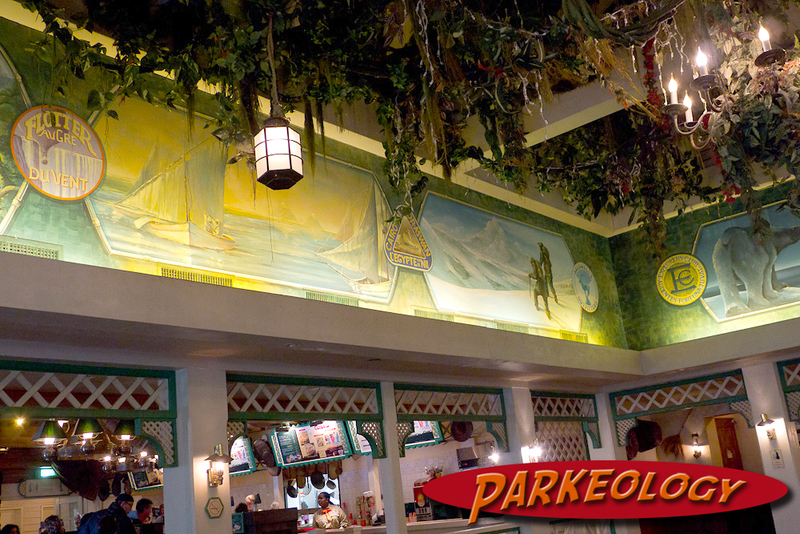 There is nothing particularly bad about this standard Disney Pizza restaurant. 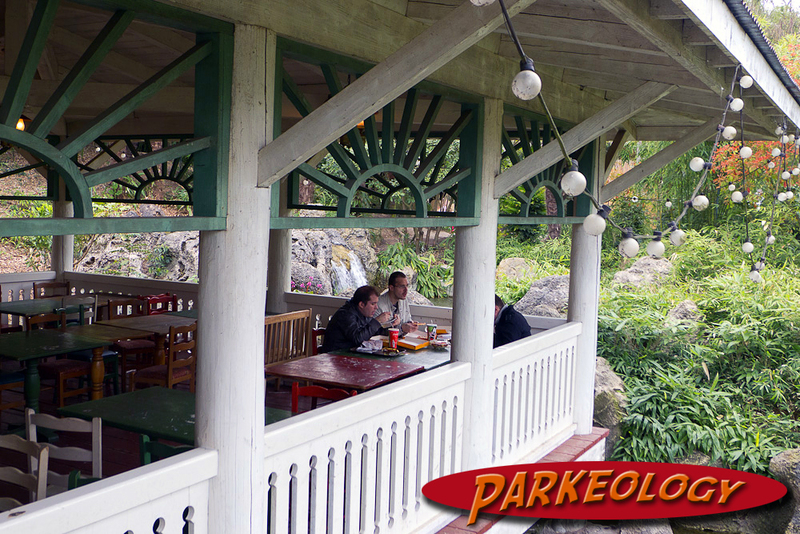 It still has a nice setting with outdoor seating overlooking waterfalls. It still has the murals and even some of the trees and props… but much of the charm and mystique are gone. The two surviving fugitives of the restaurants glorious past. 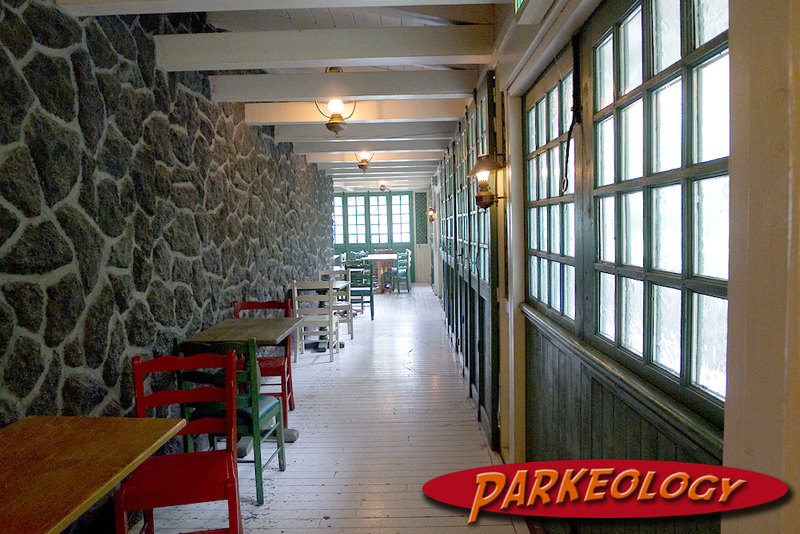 A pair of birds survived, silently sitting as sentinels of the main dining room, the bar area was removed to make way for the counter service area, more tables were crammed in and over the years most of the props and detail has been stripped away. Look closely however and you can plainly see the Explorer’s Club past staring you in the face. The “EC” logo remains on light fixtures, a fireplace screen and on some of the murals and fixtures. 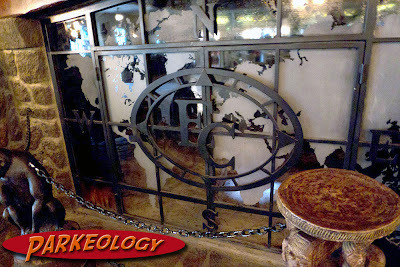 on the fireplace screen.. ecthed glass and wrote iron… nice! Why they felt an obscure character from the Jungle Book was vital in the renaming is beyond me. Other than on the exterior sign there are no references to either Colonel Hathi or the Jungle Book in general. 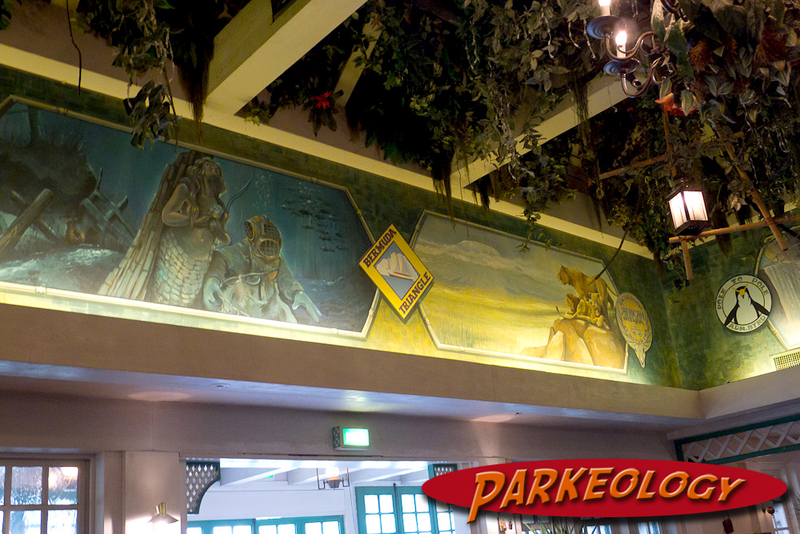 Ironically Colonel Hathi himself was based on the very type of explorer who would be a member of this club. Depiste being the namesake this is the only place you actually see the Colonel. 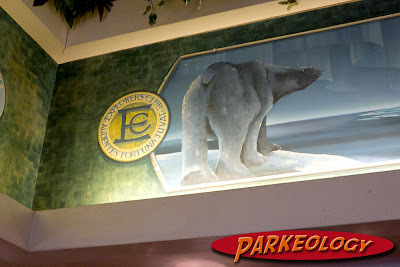 Why not keep the Explorer’s Club name and theme and just change the menu? 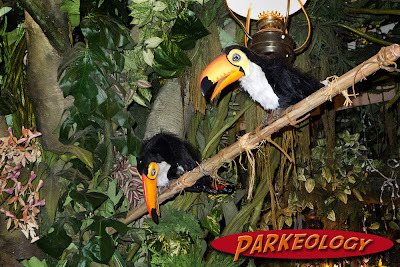 Who knows, perhaps they felt they needed a clean break but the past cannot escape a seasoned Parkeologist as the photos will attest. 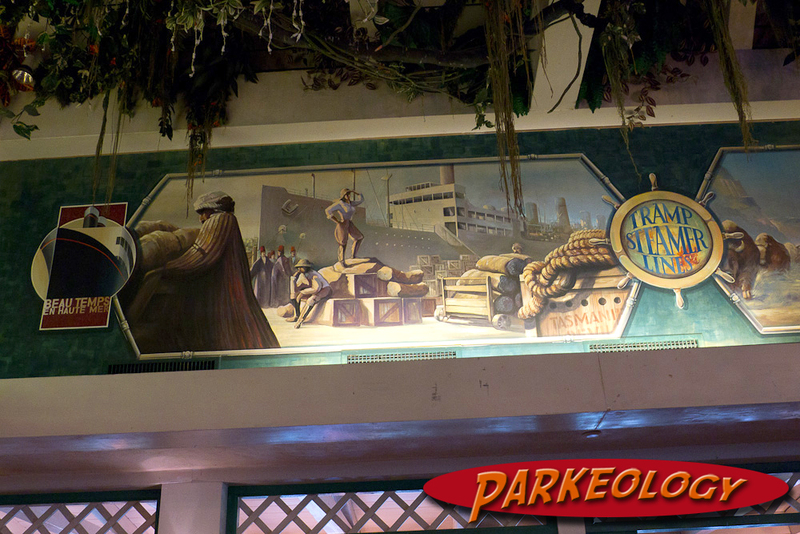 Beyond the somewhat sad history of this place the beautiful art work and some of the themed props have survived. 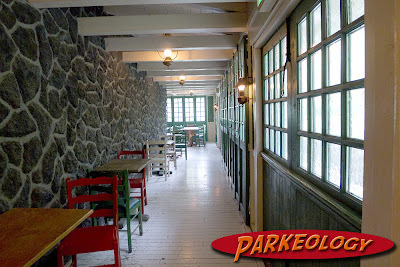 Other smaller dining rooms offer great details and the outdoor seating has splendid views. The Explorer’s Club did not get any support when it closed, no online petitions (there was not much online in 1993) and no fan clubs. 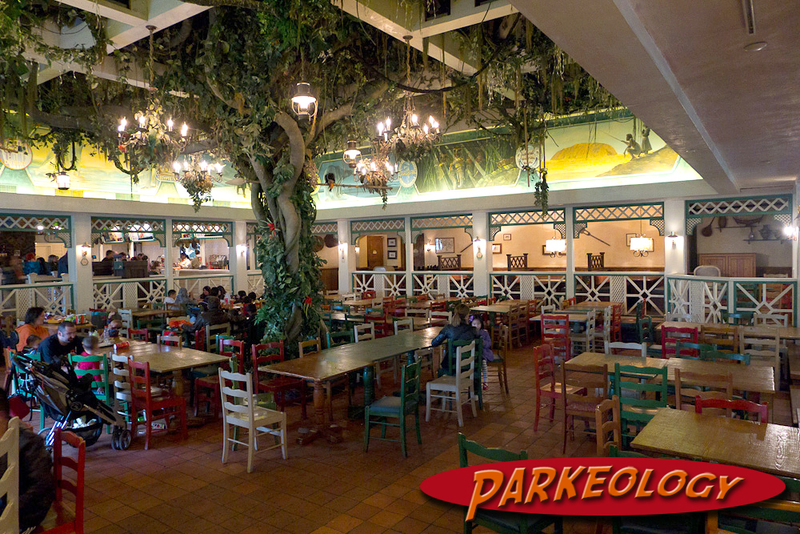 Perhaps a lone French guy shed a tear but it was only open about a year, not really enough time to gain much traction with park fans. It was and even still is a great place to see what Disney does so well. 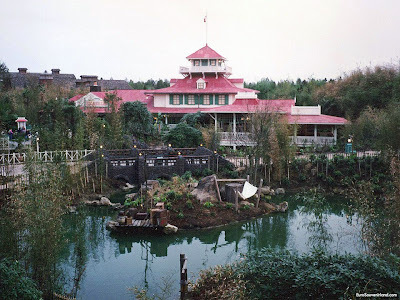 If they ever choose to flesh of the original Disneyland Paris park maybe they can reinstate the original theme and restore the place to it’s former glory… and then again maybe it’s New Years Eve. As seen today… HAPPY NEW YEAR! This entry was posted in Lost and Abandoned Disney Details and tagged Adventurer's Club, DIsney Studios Paris, Disneyland Paris, Explorer's Club. Bookmark the permalink. The music loop in Explorer’s Club used to run for one hour, but Disneyland only kept 15 minutes of it when they added the Jungle Book soundtrack. If you go there, pay attention to those colonial-like fanfares and marches. I recognized “Colonel Bogey March”, “Onward, Christian Soldiers”, “RAF March Past” and “Polyushka Polye”. Wow Melissa… going old school osncure there with a Golden Monkey reference… I bet even Shane was stumped by that one. Sorry Shane, I know… I will get my expense account turned in as well. Thanks for this pictorial tour. I had actually forgotten all about this restaurant, and this is far more detail than I remembered. Btw, please replenish the petty cash drawer in the main office. As we’ve discussed, it is not there to serve your random international cartoon pizza whims. You sensed that the original designers wanted you to sense! Birds, animated trophy mounts etc. The really crazy thing is that WDI has been trying to pair a AA bird show liek this with dining since the original concpet of the Tiki birds… they tried with Club 33 and many other times… this was as close as they have ever come to making it work… it lasted 13 months. 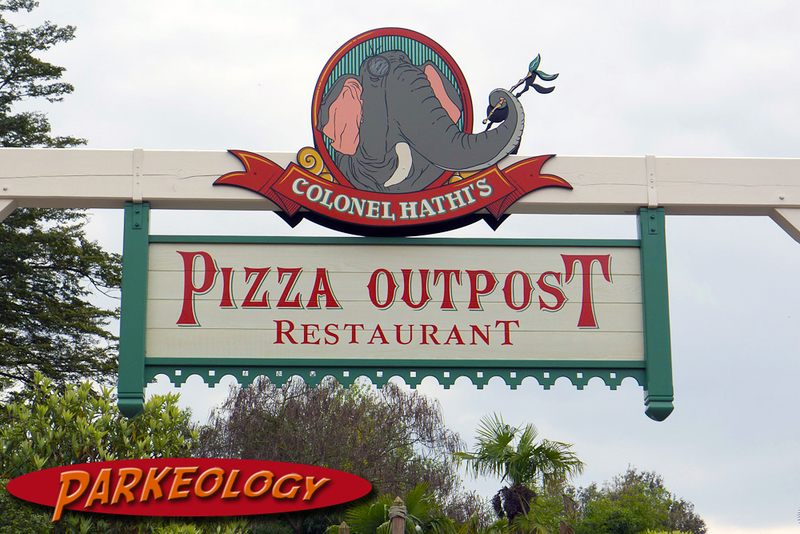 I once dined at Colonel Hathi’s. 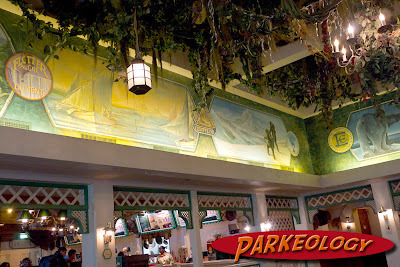 The funny thing is, when Mom and Dad were ordering our pizza, I kept looking up at the jungle infested ceiling almost expecting to find a Tiki Room bird there. I don’t know why, it just felt like there was supposed to be AA birds up there, and I was wonderin’ why there weren’t any. (I don’t think I saw the two birds left over.) Now to learn that there was AA birds there at one point is really cool. And kinda creepy. How did I know that? I wish we could have gone earlier so we could’ve eaten at the Explorer’s Club version of the restaurant. It looks like it was a really fun place to eat!